I can’t tell you exactly what went down with the development of The Guilt Trip, but I suspect that, somewhere down the line, there was a conversation that went, “Rogen. Streisand. Man. Woman. Mother. Son. Old Jew. Young Jew. Sounds like a movie to me!” And I suspect that the process of writing the screenplay was not much more sophisticated. I cannot deny The Guilt Trip its charms. It has moments. I chuckled but ultimately I felt, for lack of a better word, guilty for allowing myself to enjoy it to even a small degree. It felt like I was rewarding mediocrity; like they got one over on me a la “I’m Seth Rogen and this is Barbra Streisand. We are going to banter onscreen for 90 minutes and you are going to love us.” I got suckered in; I sat there and watched this film that represented a minimal expenditure of creative effort. The “Guilt Trip” could have been better but I get the sense that nobody even tried to take it to the next level. The first red flag for me was Rogen playing a subdued scientist. That’s just not right. Both Rogen’s performance and his character are inconsistent and not fully formed. In the drama Take This Waltz, Rogen shows that he can tone it down and play it straight but here, in a comedy, he feels stifled, as if he is not always sure of what he’s supposed to be doing with his character. Streisand is a Jewish mother. That’s her character and that’s what she plays. Sure, even though they give her some backstory, her Joyce is not a real, dimensional woman with a personality, feelings and opinions; she is schtick. Jewish mothers are all the same. They don’t have personalities. They are Jewish mothers and that is their personality. That said, for all of her serious filmmaker moves in recent years, it is easy to forget that Streisand has genuine, comedic chops. Even though they were on display in the Focker movies, here she recalls her What’s Up, Doc? and For Pete’s Sake-era persona. In the event that the onscreen pairing of Rogen and Streisand is not enough to send you racing to the nearest theater, there is a plot that involves, of all things, a man taking a cross-country trip with his mother. Rogen’s Andy is a sad-sack organic chemist who has invented an all natural organic cleaning product that is both safe to use and effective. His problem is that he is a terrible salesman and all of his pitches to major retailers fall flat. For some reason, he flies from his home in L.A. to his childhood home in New Jersey so that he can embark on a road trip to pitch the product. Believe me, I did see this movie but I swear I cannot remember or exactly figure out why he decides to invite his obnoxious, overbearing mother to join him. I write screenplays and teach screenwriting for a living and I am still trying to discern, understand and accept his motivation. That’s what I mean about taking this movie to the next level. I’m sure they could have come up with something better, couldn’t they? Now, don’t get me wrong, I love road trip movies but does anyone ever take to the highways with someone they actually get along with? Oh, that’s right, movies are about people taking journeys — either literal, physical trips or spiritual, emotional voyages — where they end up in a new place, as new or whole, better, people. So, guess what, Andy and Joyce clash, things come to a head, they apologize, see each other in a new light, bond and move on, happier. Guilt Trip 2: The Guiltier Trip, anyone? 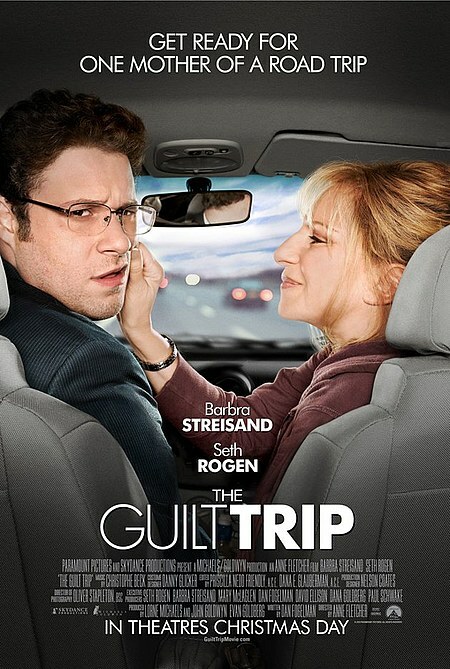 The Guilt Trip is now playing in Philly-area theaters.